There is no price to be paid for happiness. 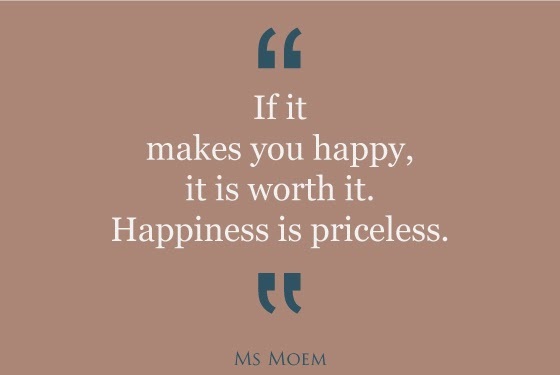 Yet it is the most prized and priceless possession! I met a young man just now who said he had chosen to lead the marketing function for an institution that groomed next gen leaders, instead of joining a tech start-up, because the marketing role was closer to his idea of “happiness”. I salute the young man. How many people really care to follow their bliss, or choose to do what gives them joy? Most people’s choices are driven by the earning potential these choices offer than by the opportunity to be happy doing what they end up doing! You cannot be happy by working harder, being more successful or by having more wealth. You can be happy only by being yourself. Your natural state is happiness. And if you are unhappy, it is in going back to that native state is where you will find happiness again. Within you. That state can be found by stopping to think who we think we are. You are not your degree, you are not your position, you are not your apartment or car or bank balance. You are you. Just you. I met someone, a noted movie actor, sometime ago who was saying he was upset with the way certain sections of the industry were treating him. He was well past his prime but felt he must still be treated like a star. And he was suffering because of the way some young turks in the industry were ignoring him. His suffering came from his idea of himself. Not from his real Self. His real Self was pristine, past its professional prime, but beautiful, remarkable and talented. But his idea of himself as a star was hurting him. That was the cause of his unhappiness. There is no blame game in this. All of us have a skewed idea of who we are. Because we are often asked this question – ‘what do you do?” So, we end up thinking that we need to have a calling card, a vocation, a social perch, a money-making crutch to answer a question that really means ‘who are you’ but is disguised as ‘what do you do?’. Now if you answered this question saying I am a doctor, a lawyer, an actor or a teacher, you are fine; you are socially correct and ‘respectable’ therefore. But supposing you said, in response to the ‘what do you do?’ question: ‘I live’ or ‘I enjoy’ or ‘I just be’, you would be seen as a ‘socially (in)different being’. But those answers are the ones that really pertain to you. And if you understand the question, understand the answers to be true, only then will you understand happiness. Happiness is loving what is. Simple. So, stop wanting and start being. You will be happy. Instantaneously!